Widely known as 'Inga the Winger', Va'aiga Lealuga Tuigamala is also known as being one of the most powerful, hard-hitting and versatile backs ever to play the game. As well as representing the All Blacks at international level, Inga also played for Samoa in both rugby union and rugby league both at centre and on the wing. As an All Black, he played in 19 tests (scoring 5 tries) and 20 non-international matches (scoring 9 tries). He represented New Zealand in rugby union as a winger from 1989, playing his first test match against the USA in 1991 before switching to rugby league with Wigan in 1993. In rugby league, playing as a centre, he became an integral part of the highly successful Wigan team of the mid 1990s, winning the 1994 and 1995 Challenge Cup finals. He also played international rugby league for Samoa, including at the 1995 World Cup. Inga made the move back from league to in 1996 when the 15-man game turned professional. It proved a wise choice as he won the English Premiership with Wasps before joining Newcastle Falcons in a then world record £1m deal. Inga scored a hat-trick on his third appearance for Newcastle against Moseley at Kingston Park and was an important part of the 1998 Championship-winning side. He then delayed an arm operation to put in a Man of the Match performance in the 2001 Cup Final. 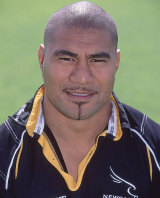 After his international successes with the All Blacks, Inga made his debut for Western Samoa against Ireland in 1996, going on to play 23 Test matches, scoring 3 tries. He was an important part of the Samoa squad at the 1999 World Cup. Despite his ferociously physical approach on the field, Inga is also well known for his devotion to the Christian faith, and in particular for the influence he had with future England rugby union captain Jason Robinson, a team-mate at Wigan. Over their months of friendship, Tuigamala shared his Christian faith, and is credited as being a key influence in Robinson's resurrection as a man and player. In 2008, Tuigamala was made a Member of the New Zealand Order of Merit for services to rugby and the community in the Queen's Birthday Honours List.